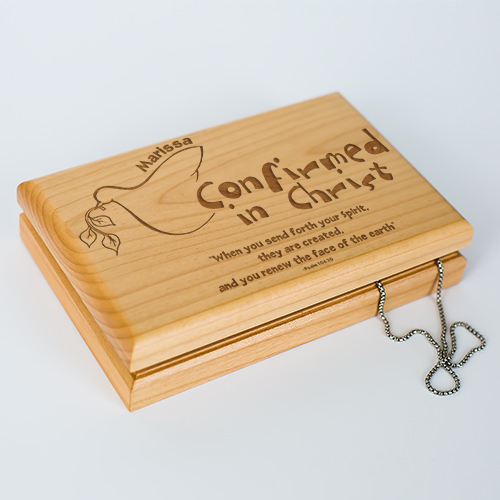 This Confirmation personalized keepsake box is the perfect gift for anyone experiencing the blessed event. This handsome personalized memory box will neatly store important items, including precious mementos and reminders of the special day. Your Confirmed in Christ engraved valet box will be personalized with any name, up to 16 letters, to make this one-of-a-kind. This personalized Confirmation jewelry box is handmade from natural cherry wood. It measures 7½ x 4¾" and features inside felt-lined compartments and hidden solid-brass hinges. Valet box measures 7½" x 4¾" x 1½"
Inside has felt lined compartments and hidden solid brass hinges. I bought this for my granddaughter's confirmation, and I loved it. The quality is good and engraving is perfect! I would recommend it!!! Very nice. Very satisfied. The box is beautiful. This was very nice - exactly as pictured, well made and nicely engraved. It fit the occasion perfectly.